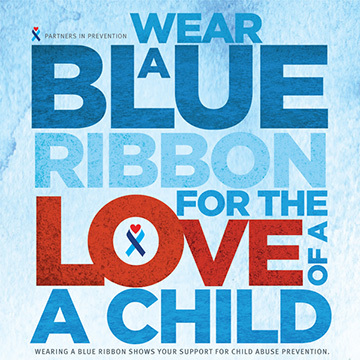 The national Blue Ribbon campaign began in the spring of 1989 as one woman, Bonnie Finney of Norfolk, VA, tied a ribbon to her car antenna to take a stand against child abuse after experiencing the death of her grandson. National Child Abuse Prevention Month is a time to acknowledge the importance of families and communities working together to prevent child abuse and neglect, and to promote the social and emotional well-being of children and families. During the month of April and throughout the year, communities are encouraged to share child abuse and neglect prevention awareness strategies and activities and promote prevention across the country. All 10 Bay Area Counties have events and awareness campaigns for the month of April. Contact your council to find out more. You can also show your support by sharing #HowWeDoBlue. Partners in Prevention is inviting you to share your pictures and tell your stories about how you show your support for the cause. Let's be partners in prevention!